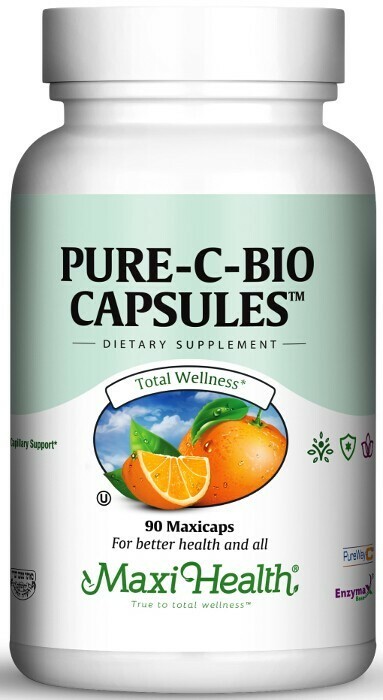 Pure-C-Bio Capsules™ is our unique combination of pure vitamin C and lemon bioflavonoids in capsule form. Bioflavonoids work synergistically to improve the absorption of vitamin C.
This combination supports blood vessel, capillary, vein strength and protection against free radical damage. Each tablet provides 300 mg of vitamin C and 600 mg of lemon bioflavonoids. Try, Pure-C-Bio Capsules™, a no-nonsense approach to good health. Take one (1) MaxiCap™, two to four times daily, or as directed. This product contains NO animal products, wheat, soy, salt, milk, sugar, yeast, gluten, artiﬁcial ﬂavors, colorings or preservatives. PureWay-C® is a registered trademark of Innovation Laboratories, Inc. U.S. and International patents pending. Enzymax ® , a vital digestive enzyme complex, is a registered trademark of Maxi Health Research ® LLC.